In the recent years scientists have come to understand that inflammation is a major contributing factor to a wide range of health problems. Initially, a response to injury or illness, inflammation increases blood flow and brings healing oxygen and immune cells to try to correct the problem. 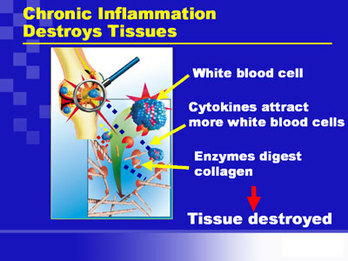 When the problem is not corrected, the inflammation itself begins to cause stress to the surrounding tissues. The inflammation does not go away on its own and continues to adversely affect our body. This is an irony that occurs over and over in our bodies. and the body attacks itself. Inflammation - Cytokines - T Cells - Macrophages . . . all can become examples of "Good gone Bad". Autoimmune diseases are also all too common examples of good gone bad. When the body attacks itself! peptic ulcers, lipodystrophy, moon face, liver and kidney injury. Immunosuppressant drugs can be life savers for extreme conditions. For example, when organ transplants are conducted, these drugs are worth the side-effects, because they help the body not to reject the newly inserted life-saving organ. The rest of us need to investigate other options. You should begin to feel positive effects from the onset. 10. Salmon (get the wild kind, from Alaska, not the Atlantic salmon, which is usually farmed). Herring, sardines, tuna are good too.